Follow Alan Zisman on Twitter. I bought the Intel iMac on Halloween 2006: Core 2 Duo, 2 GB RAM, 250 GB hard drive. It let me get in on Apple's shift to Intel processors, gaining the ability - vital for my Mac2Windows articles - to experiment with the various ways to run Windows (and other PC operating systems) at reasonable speeds on Macs. Lately, though, I've been more likely to use a notebook for most of my computing, and the iMac got taken over by my wife. But recently, she'd been getting increasingly frustrated with it. Her complaint: It was taking longer and longer to do simple things - open programs, for instance. Copy files. Start up. And she was right. When I came over and looked, the cute little coloured spinning wheel was spinning far too often for far too long. Disk Utility found a whole slew of permissions needing repairs - and fixed them. Or so it said. Repair Permissions is an option in Disk Utility. But after restarting, the system seemed just as slow as before. And after rebooting and rerunning Disk Utility, the same errors were found and reportedly fixed. Repeat, and the same thing happened again. And again. Each time, Disk Utility's Repair Disk option reported that the hard disk was just fine, thanks. Because I'd had hard disk failures on other systems in the past, I now run the little free SMARTReporter (SMART is a monitoring system for hard drives intended to predict failures) on all my Macs - it also reported that the hard disk was okay. My next step was going to be to erase the contents of the disk and reinstall Mac OS X, applications, and data. Hopefully a new fresh start would fix whatever was causing both the recurring file permission problems and the slowdown. The good news - the system was set up to use Apple's Time Machine to make regular backups to an external hard drive. But I've had bad experiences with backups; even though the Time Machine backup seemed okay, I wanted a backup to the backup . . . Linda's photos and other documents are too important to her. I have a 16 GB USB memory stick that had enough free space to hold all her stuff, so I dragged her Documents and Pictures folders to it. On a computer that was functioning normally, copying 6 GB or so of files shouldn't have taken too long. In this case, I had to let it run over night. Next morning, feeling like I could guarantee that I could reinstall Linda's data, I booted again to my Leopard install disc, and again opened up Disk Utilities. This time, I went to its partition tab, removed the existing partition, and created a new one - I didn't want any file system problems carried over from the old installation. It seemed to take an excessively long time to format the partition, but eventually it finished, letting me start a clean OS X installation. 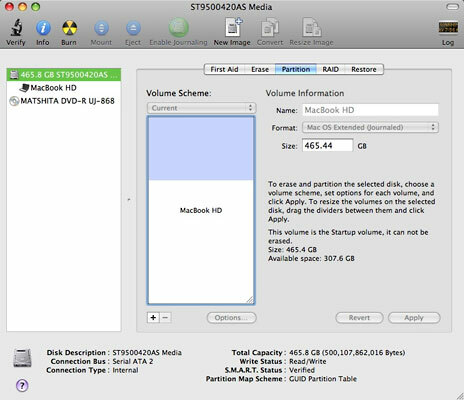 You can partition your hard drive using Disk Utility. Though that normally takes an hour or so, when I went to bed, it was about 40% done - again, I left it to run overnight. In the morning, there was a warning message that the installation program was unable to copy all required files. Maybe there's a problem with my Leopard install disc? The flawed installation, however, had gone much too slowly; maybe it was a hardware problem rather than a software or file system problem. I've replaced lots of hard drives in lots of computers, but I wasn't sure how to get at the hard drive in this one. The first generation of 'slab' iMacs had an easily removable back, making the hard drive, memory, wireless card, and more easily accessible. But in all the following models - the ones with the built-in iSight cameras - the guts were much harder to get to - there's a panel on the bottom so users can easily upgrade the RAM, but accessing other parts is much more work. Some time researching online convinced me that I didn't want to replace this hard drive myself. "I didn't want to replace this hard drive by myself." I repartitioned the drive (again - and just as slowly) and tried the OS X 10.4 "Tiger" disc that had come with the iMac when it was new, though I didn't think that would be of much use. At the same time, I made an appointment for the next day at the Genius Bar in my local Apple Store. The Tiger installer ran - again, very slowly. At one point, it claimed it would need 53 hours to finish the installation. Again, I let it run overnight. In the morning, it was finished - with Disc 1; it wanted me to insert Disc 2 to continue the installation. Instead, I gave up, ejecting the disc, shutting the system down, packing it up, and hauling it to the Apple Store in Vancouver's Pacific Centre Mall. The Genius listened to me explain why there probably wasn't much need to plug in the computer and turn it on - that there wasn't a complete operating system installed. After listening patiently as I explained everything I'd tried, he agreed that the hard disk probably needed replacement. His suggestion surprised me - take it to one of Vancouver's independent Apple dealers, he said. His explanation - I could leave it at the Apple Store and have the work done by Apple, but they would only replace my 250 GB drive with another 250 GB drive, and it would probably cost more that if I had it done elsewhere. I can take a hint - I took the iMac across town to Apple dealer Simply Computing. Agreeing that the issue was probably the drive, the technician offered me either a replacement 250 GB drive for CDN$80 or a $500 GB drive for CDN$91. Even though my wife's data needs are fairly modest, for such a small difference in price I went with the larger drive. Labour to install the drive: one hour (CDN$80). For an additional half-hour labour they would install the operating system; by showing them that I owned a retail Leopard package, they offered to install Leopard - handy for me since I now have suspicions there may be problems with my Leopard install disc. Best of all - even though it was around noon when I dropped it off, they thought the work would be done by the end of that afternoon. Even though I'd carefully made a copy of Linda's documents (etc.) on my USB memory stick (taking a day in the process), I didn't need it. When I got the iMac home and fired it up, the first thing it asked was whether I wanted to transfer files from another system or a backup. Choosing backup, it found the connected Time Machine drive, let me choose to copy over Linda's stuff (and let me ignore my old user account), settings, and applications. All very smooth. Just one little complaint - the process sat at "One minute remaining: transferring application support files" for about 20 minutes. Just as I was about to conclude that it had hung, it finally popped up the screen reporting that it was done. It can be hard to tell whether a computer problem is hardware-based or software-based. I spent a lot of time repairing permissions and trying to reinstall the operating system that was to no avail. Still, it was worth trying. Neither Apple's Disk Utility nor SMARTReporter reported any problems with the hard drive. Nevertheless, that's what the problem was. Hard drives fail. That's one of the reasons why backups are important. Some Apple systems - think the coloured G3 and G4 towers, for instance - have been designed for easy access to the components. Other systems - from the original "classic" Mac on - have been much harder for do-it-yourself repairs and upgrades. I wish Apple paid as much consistent attention to designing for accessibility as they do to designing for physical appearance. On the other hand, Apple has done an exceptionally good job with Time Machine and the Migration Assistant of making it easy to recover from this sort of problem. Of course, this assumes that the user has backups to restore from. It's easy to dump on computer technicians. In this case, however, when I finally took my Mac in for service, everyone I dealt with - both at the Apple Store and at my independent Mac dealer - was helpful, honest, gave good value, and got the job done quickly. I couldn't ask for more. I always purchase extended warranties for notebooks, but tend not to bother with desktop systems. In this case, if I had purchased AppleCare for this iMac, the cost of the new drive would have been covered - this happened 3 months before what would have been the end of the extended warranty. On the other hand, AppleCare costs CDN$199 (plus tax) for this system; that's almost exactly what the repair cost, so I can't conclude that I should have purchased the extended warranty.